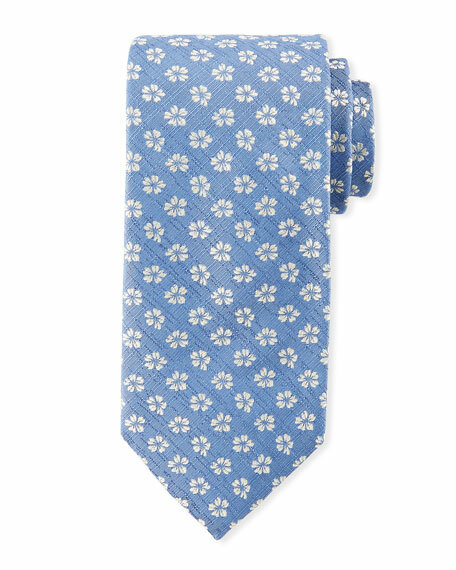 Canali tie featuring floral pattern. BOSS tie in mini geometric pattern. Approx. 2.4"W (6 cm). Silk. Made in Italy. Brioni houndstooth plaid silk tie. Approx. 3.5" at widest point. Silk; dry clean. Handmade in Italy. Canali woven tie with four petals medallion pattern. Approx. 3"W; 57.5"W. Silk; dry clean. Made in Italy. Canali tie featuring woven medallion pattern. Greater than 3" at widest. Silk. Made in Italy.